I love to “adjust” things or try to tweak a piece of equipment to get it to perform just a little bit better than it was when I first tried to operate it. Surely, my idea is even better than theirs! This is in direct conflict with the practice of thinking “if it isn’t broken, don’t fix it” that I have been using in my herbicide programs for the last several years. This year’s conferences carried a common theme on weed resistance. If you have a program that you feel is working perfectly, you better add something to the mix or you could end up with severe weed pressure from weeds that have adapted resistance to your current management program. This involves learning to identify herbicide families and how they work, then using at least three herbicide families per field per year-just one more thing I need to worry about. In 2017 I will add dicamba resistant soybeans to battle weeds. When I first let my daughter, Callee, convince me that I needed a 20/20 planter monitor, I did it as a favor to her, because I already knew everything I needed to know about my planter….boy was I in for a surprise! Until I could quantify the planting errors that I was making in dollars and cents, they were not in my focus at all. Once again I had to admit that Callee was right when, several years, ago Precision Planting’s automatic down force, called Delta Force, became the next one more thing which helped me break through yield levels that I never imagined reaching. For 2017 I am adding v-drive (electric meters) to control variable rate seeding and row shutoffs. Split application of fertilizer is also on our 2017 cropping practice target, so, this year I am looking at several one more things! Split application adds that final push of fertilizer to reach the optimum yield potential on each acre farmed, not field potential but rather dialing in on each acre’s potential. Many one more things could be added to current practices without adding many total dollars to expenses while delivering the highest possible profits. 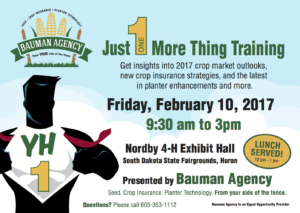 Plan to attend Bauman Agency’s “Just One More Thing” seminar on Feb 10 at the Nordby 4-H Exhibit Hall on the SD State Fairgrounds. 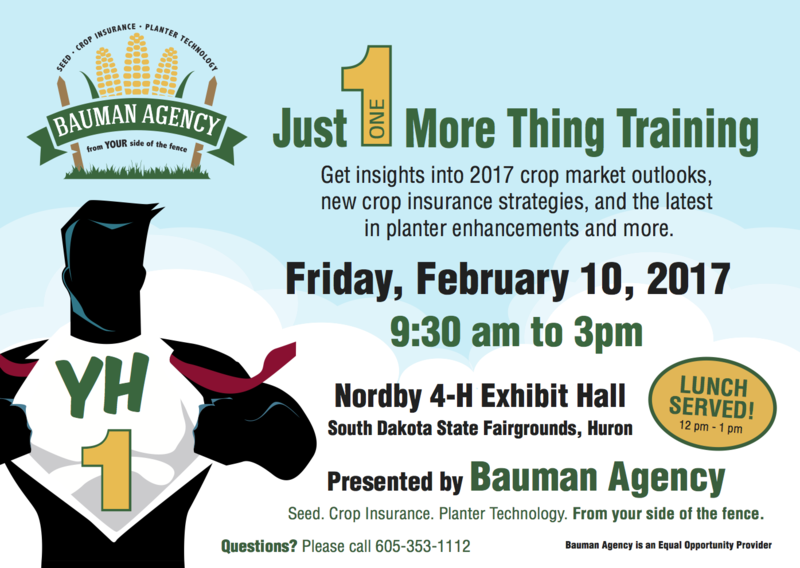 Get insights into 2017 crop market outlooks and new crop insurance strategies as well as the latest in planter enhancements available to make your planter run better than when you bought it. Hopefully your head fills with ideas and you find your just one more thing to make 2017 the best year possible. See you there.